The PR230 is a premises powering unit that integrates NT1 caging, 48 volt DC power, and battery backup in a single unit for powering ISDN telephones and Lucent P-230 circuit card NT1's or equivalents. The PR230 is available in two configurations. The PR230-24 will house and power up to 12 P-230 NT1's and provide power for up to 24 phones in a multipoint mode. the PR230-48 adds additional caging to house and power a total of 24 NT1's with power for 48 multipoint phones. Note that the PR230-24 can be field upgraded to PR230-48 capacity via an SEI 230R NT1 cage. For both PR230 models output distribution is accomplished using standard 50 pin amphenol connectors which eliminate the need to use punchdown blocks. All power lines to the terminals and NT1's are protected by solid state thermal fusing. Dual load-sharing rectifiers offer redundancy, while additional external battery packs can be added at any time for increased standby time. During extended periods of utility outage the batteries are protected from over-discharge by the built-in low voltage detector and disconnect circuit. Remote monitoring is provided by a contact closure that can be interfaced to a remote alarm unit. 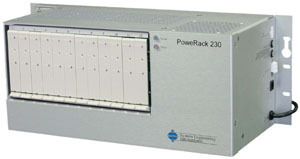 The PR230-24 can be utilized to provide power to legacy NT1 cages such as the Lucent NT1M-210. Additionally, a stand-alone 230R expansion cage may be powered by third party powering units such as the Lucent 1145. All PR series units are mountable either on a wall or on 19" racks. Mounting brackets for 23" or 25" racks may be ordered as options (specify 23RM or 25RM after the model number).